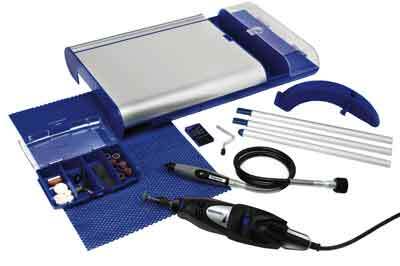 This kit comes with an entry level Dremel 300, Flexshaft and a useful variety of accessories, all packed inside the base of the hobby table, which acts as a work surface. This also includes a guide rail for a support post, which turns the Multi-tool into a hanging motor. All of the components can be conveniently stored in the base when not in use. Initial assembly of the components was straightforward and the assembled unit will provide a useful work surface that can be set up almost anywhere Although this product is aimed at the hobby end of the market, I was a little disappointed that the right-hand end of the table has rather more flex in it than I would have liked to see. This minor issue apart, I found the kit to be excellent value for money, although for those who do have a workshop, a similar version without the hobby table is available. This little Dremel with its flexible shaft and multi-chuck is the ideal tool, with the addition of suitable burrs, for those turners who wish to experiment with texturing or piercing work, and the worktable, which is supplied with a non-slip mat for workholding is well suited to working on small pieces that can be hand held. Work on larger pieces would require suitable workholding arrangements, but the Dremel 300 and Flexshaft would easily be able to cope. The wide range of accessories provided makes this tool a valuable general addition to any workshop and it has been in constant use throughout the test period for all manner of tasks. Having the Multi-tool, with Flexshaft attached suspended over my workbench, has meant that I have found many new uses for it. Whether using handheld, or with the Flexshaft attached, I found it light, comfortable and convenient to use. This is a versatile piece of equipment with endless uses. For the woodturner, it is an excellent unit for texturing, etc. without the need to invest in a hanging motor, whilst for those without a dedicated workshop, the worktable and the ability to store the whole kit away inside it will prove invaluable. 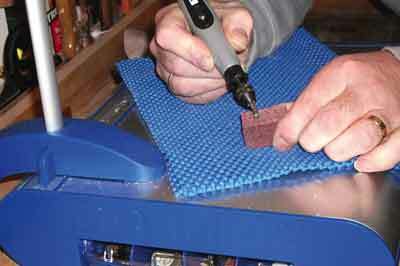 The Dremel handpiece is easy to hold and use - it really is an excellent tool. The flexible-shaft makes some operations easier to work on. The workstation is fine for those working in tight confines, but if you really like and get into power carving or enhancement of work, you would need something a little more substantial.